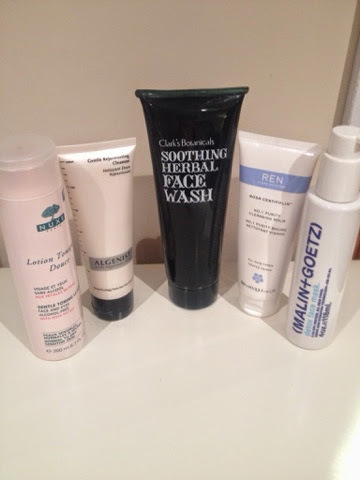 Cleansers.... What Cleanser should I be using? With all the latest options in Cleansers sometimes it feels like a hazardous guess whether we choose the right one for our skins needs! As most of us assume that cleansing is just to remove makeup,dirt and grime which of course it is but now we have all these options with Anti-aging ingredients, Salicylic acid, Glycolic, Retinol the list is endless! Which one to choose is the question? No Nasties... My advice is that you buy a cleanser that doesn't contain Parabens(perservatives). Doesn't also contain Artificial Fragrance that may irritate the skin. Then whether it's Foam, Cream, Milks, Oil or Balm is then a matter of preference. Double Cleanse... Not everyone needs to double cleanse. If you wear makeup and you want a cleanser that is gentle but will remove waterproof mascara with ease then try out a balm or oil based cleanser using a damp wash cloth. I would recommend that you have a few wash cloths as bacteria can build on them and transfer onto your skin. You can pop them in with your regular laundry washing. Exfoliate... Now we have cleansers that have Salicylic Acid and Glycolic Acid which gently exfoliates the skin. Great for more sensitive skin prone to redness or Rosacea that would react to manual scrubs. Scrubs are great so if you like the feel of it then two to three times a week is a good starting point. Toner... I would avoid Alcohol based toners as they can strip off natural oils. Gentle Toners that contain Rose or Camomile calm the skin and can balance PH levels although with the correct cleanser this step isn't necessary. If you like the feeling then you can use a gentle Alcohol Free toner. Save... Your more expensive ingredients like Antioxidants,Retinol,Anti-aging ingredients for your products you leave on your skin for example your Serum,Oils and Moisturisers.